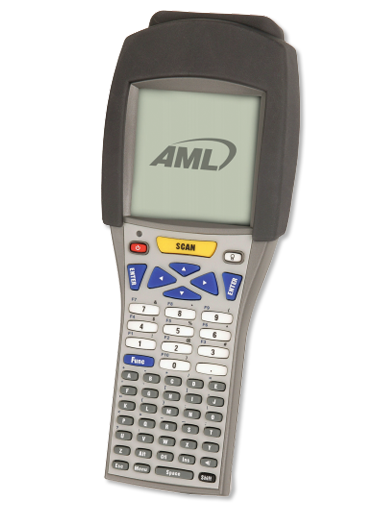 The AML M7100 is richly configured with advanced features to optimize operational efficiency and productivity — ensuring the rapid, timely processing of mission critical data, even in the most demanding applications. Powered by the fast Intel StrongARM processor, the M7100 is equipped with 16MB of built-in RAM and 4MB Flash ROM for ample storage capacity. Contact us today about buying, servicing, renting or selling M7100 gear! Its internal radio supports IEEE 802.11b wireless local area network (WLAN) connectivity for real-time, high-rate data transfer between wireless operators and host applications (optional wireless wide area network GSM/GPRS connectivity for route accounting, delivery, and other field service applications). Extended operation is ensured by the AML M7100’s enhanced power management, which supports eight-hour work shifts without recharging. The M7100 is also known as the American Microsystems M7100.Contact us today about buying, servicing, renting or selling AML M7100 gear!